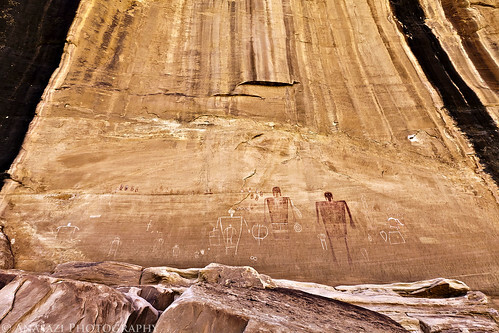 The Big Man Panel in Grand Gulch is a large pictograph and petroglyph panel located in a very large alcove about 200 feet above the canyon floor. It’s not visible from the bottom, so you need to climb up to it if you want to see it. The focal point of this panel are the two life-sized anthropomorphic figures painted in red that seem to represent a man and woman This photo shows a wide view of the alcove and the pictographs painted within. In the future I will post up some closer photos of these figures for a better look at them. This is an amazing panel to view, and it’s easily seen on a day hike into Grand Gulch.